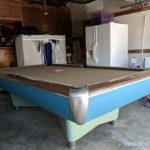 Upon arrival at our pickup location in Anaheim, California, we found a 9′ AMF pool table completely upside down. 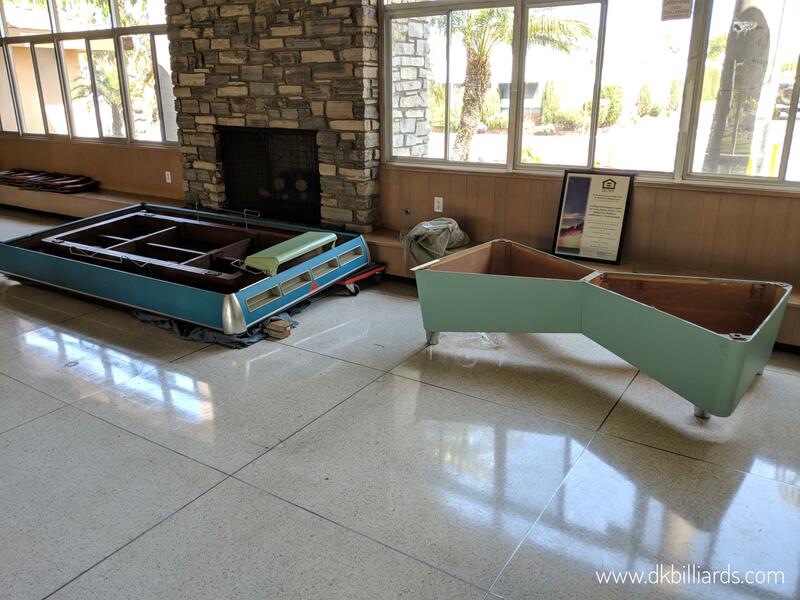 The rec center was getting rid of this 1960s relic to make more space for events. 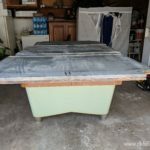 The new owners decided that a few men and heavy-duty tools from their concrete business would be enough to get this table to its new home in a Lakewood garage. They tried to accomplish this feat by removing the legs, then trying to carry the remaining part out. Unfortunately, this method backfired. The slate was still on the table making the whole thing super top heavy. The men set it down. Upside down on the floor. Our plan was not to move a table in this condition. But, months ago, we came out to this very same location to disassemble a matching table. 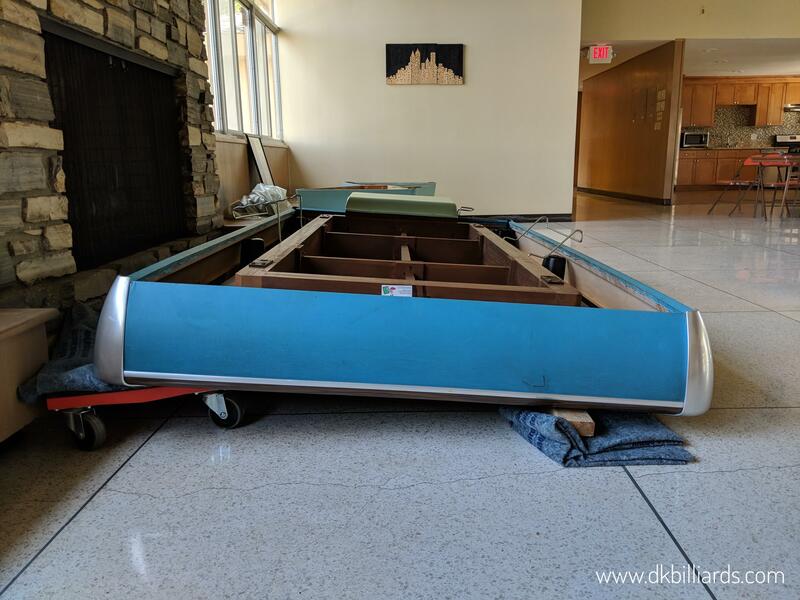 The rec center was downsizing their billiards area and hired us to properly disassemble a 9′ pool table and store it on site. 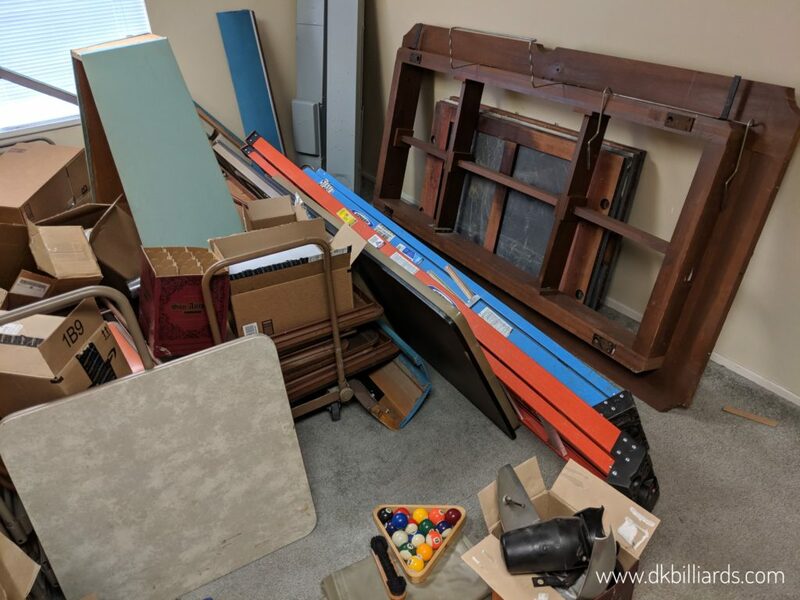 A couple of quick phone calls later, we accessed the storage area and moved the dismantled table to the van to continue our move job. 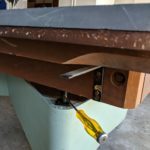 The improperly moved pool table was left behind, arrangements made for the responsible party to attempt to get it out without damaging the table, facility, or injuring themselves. The pinch-hitting, midcentury AMF from storage was set up in the garage. Installation went smoothly, thanks to AMF frame leveling. These types of tables do not have leg levelers on the fixed feet. AMF integrated a frame leveling mechanism. Using a screwdriver, adjustments can be made to the frame with the slates on top. It’s a pretty neat feature. 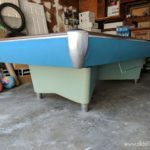 So, after the initial shock of the condition of the pool table we were supposed to move, the second table went together without a hitch. It looks retro cool and plays like a champ.